Moving to this ward was an adjustment. After a bad mishap with an inadequate nurse, I found one of the cardiologists on our team. The only reason we are still here is because of her eating. He gave us our goal. When she is eating 50-60cc on her own without the feeding tube, then we will go home. 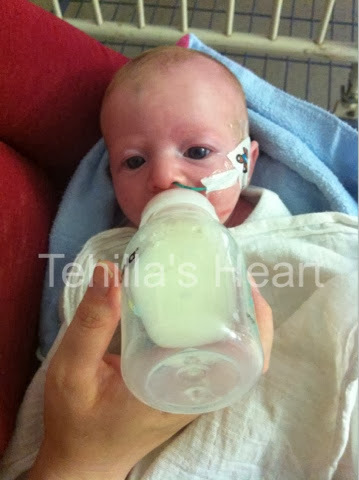 Well, Tehilla heard the pleas of her mother and ate 45cc at the next feeding. The feeding after that she ate 38cc. G-d bless her. After that, one of the pediatricians from our team came to check on her. I told him about her eating and he said, "Get her to 50cc, and you're on your way." He stayed to answer a bunch of my questions about Tehilla's care at home. This is SUCH amazing news! Keep up the great work, Tehilla! gorgeous girl bli ayen hara!!! hope it we keep only hearing good news! Hurray Tehilla and Mamma Shana!! You guys are doing great! Hang in there!